If you have a little gymnast who is wanting to start the wonderful sport of gymnastics, you might want to know what that will entail. First off, there are four events; the vault, uneven bars, balance beam and floor exercise. Knowing about the events might be helpful for you as a parent. You could help explain to your new gymnast what to expect. Let’s skip vault and swing right into the uneven bars. 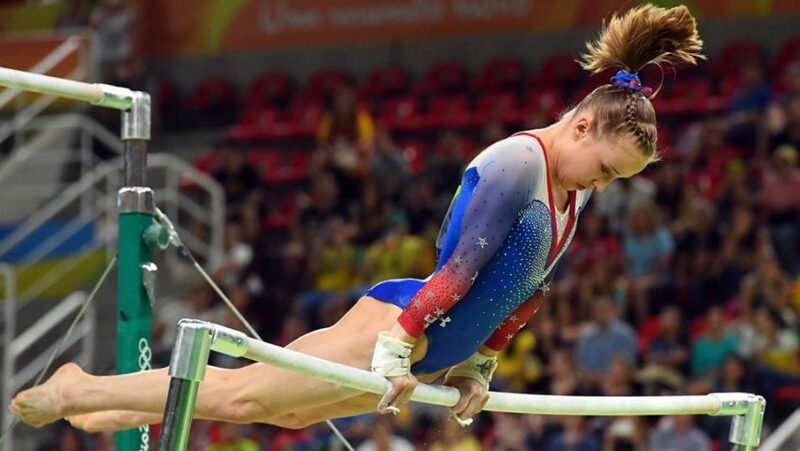 Throughout the past few decades, the uneven bars have gone through a variety of changes. Back in the 50s and 60s the bars that were used then were completely different than the bars that you see now. The uneven bars use to be close together. They were so close that a lot of the skills performed included the gymnast hitting the low bar with their hips while holding on to the high bar. Starting in the 70s, the uneven bars started to get farther apart as companies started developing cables for the bars. With the bars widening, new skills started to be invented and the uneven bars was becoming a crowd favorite. The bars are made up of fiberglass with a wood coating and they are held up with a steel frame. There are cables that connect from the high and low bars, and the frame. Those cables connect to the floor and that is what helps stabilize the bars. The cables provide support for the bars and they also help when making the bars different lengths and heights. Having the bars lower and closer is a good idea when working with little gymnasts. When learning new skills, the bar can go low so the gymnast won’t be afraid of the height. If your gymnast becomes a team gymnast and is being taught to jump from the low bar to the high bar, then putting the bars closer will make it easier at first. Since the cables are adjustable, the older and taller your gymnast gets, the farther the bars can be put out. Now there are other items that are used for bars that are not a part of the actual bar. If your gymnast loves bars and gets to a higher level, they may be asked to wear grips. Grips are made of a leather strop and a leather wrist band. In the grips are dowels. The grips help gymnasts grip the bars. Now, at any level, a rip is always possible. A rip is caused by the friction of your gymnasts hands on the bars. It causes the skin to come off from the hand. If your gymnast gets a rip, don’t worry! Rips are a very common thing in gymnastics. Getting the rips will help your gymnasts hands become stronger for bars. At first can be a little gross and it is painful but remind your gymnast that it will always heal! Chalk is another item that is used with the uneven bars. Chalk helps the gymnast grip onto the bar as well. It is almost necessary to use chalk with grips because the chalk will make the leather rougher and that makes it easier to hold onto the bar and not slip off. Now if you can get past the rips and the height, and your child wants to try gymnastics, here are some skills they will learn. First and foremost it is very important for your gymnast to be able to support themselves on the bar. If your gymnast cannot hold themselves up then it will be difficult for them to continue on to the harder skills. The next skill they’ll most likely learn is a pullover. Pulling over to get onto the bar is important because that helps build strength for your gymnast. Eventually, after your gymnast gets the hang of gymnastics they will start learning more skills like casting and back hip circles. Then after your gymnast gets the basic bar skills, they will start learning skills that involve kipping, tap swings, giants and so on. To do the uneven bars requires a great deal of strength. To be able to hold yourself up on the bar is a big deal. So to be a gymnast and pull yourself around it and then do flips and swinging skills, it means your gymnast has to be pretty strong. One might think that it only requires arm strength but really doing the uneven bars is a full body workout. Your gymnast is going to have a strong core and strong legs. Having a strong core will help your gymnast have pretty shapes while doing the uneven bars. Also, it looks better if your gymnast has their legs straight, together and pointed. To be able to do all of that requires leg strength. Doing gymnastics is a wonderful feeling. Watching your child have the time of their life will be an even better feeling. Uneven bars is an exciting event to watch. It requires strength and grace. Swinging from bar to bar is such an adrenaline rush. Your gymnast will describe it as flying because that is what it feels like. The gymnast is in control of their own body and it was a wonderful feeling to feel like you can do anything while you are on top of the bar. If you are wondering if your child should do gymnastics or not, encourage them to try it because everyone should experience the feeling of flying through the air off of the uneven bars.